A GRIMM LEGACY — Cover Reveal! Posted on June 27, 2013 by Erica Crouch Posted in Cover Reveal	. Check out the awesome cover for Patchwork Press author Janna Jennings’s upcoming debut novel, A GRIMM LEGACY. Designed by the always talented Ravven! The woods of Elorium appear ordinary, at least until elves appear and the birds start talking. Four teenagers, whisked out of their own world, find themselves as the reluctant guests of the strange and secretive millionaire, Mr. Jackson—a man who knows the secrets of their families’ histories as well as the way back home. But nothing comes without a price. Mr. Jackson’s mother is dying and the only cure is in the hands of a giant barricaded on a floating island. Unable to retrieve it himself, Mr. Jackson strikes a deal with the teens: steal the antidote and in return receive the key back to their world.Caught in Grimm’s fairy tales with characters short on whimsy and bent towards treachery, the teens begin a race against time. Without any other way home, they are forced into fairy tale roles that may not lead to a happily ever after. Add on GoodReads! A GRIMM LEGACY comes out October 1, 2013. Mark your calendars and add it to your “to read” bookshelf on GoodReads! Follow Janna on her author website, GoodReads, and Twitter. Welcome Terra Harmony to Patchwork Press!!! Posted on June 25, 2013 by Kellie Sheridan Posted in News	. Patchwork Press is thrilled (seriously guys, thrilled!) to announce a new addition to our team. Introducing, Terra Harmony! Terra has been publishing her books since 2011, and her current titles include an anthology of vampire stories, and an eco-fantasy new adult series. She’s also got a new series in the works that is going to be all kinds of awesome! Terra has already had some great ideas on how to make Patchwork Press even better, and I’m sure you’ll all be excited to see what she has been coming up with. For now, if you’re interested in reading Terra’s eco-fantasy series, stay tuned! We’ve got something in the works that you wont want to miss. For now, a message from Terra! “Hi All! I’m very excited and honored to become a part of the Patchwork Press team. Already, we have some great ideas floating around and some awesome news and special treats for our followers. If you haven’t already signed up for our newsletter, do it now – you don’t want to miss out! A little about me; I am the author of ‘The Akasha Series’ (a four book series) and ‘The Kindred Curse Anthology’ (one set of five short stories). The first book of my next series will be released this fall. It is a young adult eco-fantasy, and all about mermaids and werewolves. I haven’t even picked a name yet, but trust me – you’ll be the first to know! If you want to know more about Terra, you can check out her website, or follow her on Twitter on Facebook! Posted on June 21, 2013 by Kellie Sheridan Posted in Uncategorized	. Exciting news today! Patchwork Press is partnering up with Inaccurate Realities, an upcoming YA genre fic magazine. They’re in the midst of an IndieGoGo campaign, so we’ve offered up some bookish perks to help sweeten the pot and get people involved. So, first off… let’s hear the official pitch from the website. Inaccurate Realities is a brand new literary magazine for young adults and the young at heart. There is no denying that people of all ages are now reading YA, but when we looked around we noticed a significant lack of publications focusing on YA short fiction – especially genre fiction. Our emphasis here are Inaccurate Realities is on speculative fiction, in all its forms. Science fiction, fantasy, paranormal, horror, dystopian, steampunk, cyberpunk, alternate history and everything in between. We are a quarterly magazine and are looking for fresh and exciting Young Adult short fiction from writers of all ages. So, what are the prizes, and how can you get involved? You can get copies of the magazine, ebooks from Patchwork Press, a blog tour, and more. And if you’re a writter, they are currently taking submissions, which you can learn more about on their website. Check out Inaccurate Realitie’s IndieGoGo campaign HERE and donate to help this wonderful project get off the ground! Posted on June 13, 2013 by Kellie Sheridan Posted in Promo	. If you want to participate in the cover reveal, please fill out our Reviewer Form! Mr. Jackson’s mother is dying and the only cure is in the hands of a giant barricaded on a floating island. Unable to retrieve it himself, Mr. Jackson strikes a deal with the teens: steal the antidote and in return receive the key back to their world. Caught in Grimm’s fairy tales with characters short on whimsy and bent towards treachery, the teens begin a race against time. Without any other way home, they are forced into fairy tale roles that may not lead to a happily ever after. About Janna Jennings: Janna is a Colorado based YA author who loves a good fairy tale. She’s married to her own real life Prince Charming, and will usually admit to being mom of three, including her incorrigible middle child, Benny. Besides wrangling her kids she can be found doing some therapeutic baking, dreaming of the ocean, and of course, curling up with a good book. Posted on June 11, 2013 by Kellie Sheridan Posted in Release Day	. Guess what day it is today… It’s Ignite‘s book birthday, and we couldn’t be more excited! This is Erica’s debut novel, and we have no doubt it’ll be a hit. How could it not be? Have you seen that cover?! Erica’s tour is kicking off today at I’m A Book Shark, and it’s only the first stop of many, with lots of interviews and guest posts from Erica and six chances to win a copy of Ignite all your own. So, in case you’re new to the wonderful world of Patchwork Press… let’s talk Ignite! About the book: Penemuel (Pen) fell from grace over a millennium ago, yet there are still times she questions her decision to follow her twin brother, Azael, to Hell. Now that the archangel Michael has returned, threatening Lucifer’s vie for the throne, she begins questioning everything she has always believed. As Hell prepares for war – spreading a demonic virus and pilfering innocent souls to build an army – the lines separating the worlds blur. Fates erase and the future is left unwritten. Azael is determined that he and his sister will continue to serve as demons together, but for the first time in her life, Pen is not ruled by destiny. She has the freedom of choice. And don’t forget to add Ignite on Goodreads! Tags: erica crouch, ignite	. Posted on June 10, 2013 by Erica Crouch Posted in Other, Writing	. Not a creature was stirring, except for this author who is crazy excited and terribly nervous to have her book read by people!! Tomorrow is June 11th, the official release day of my book, Ignite. Which means today is the release day eve… day. What? I don’t know, my mind isn’t working correctly right now because AH I have a book coming out! And I think I’m going to be sick. But… in a good way, you know? Have you ever performed on stage? Either in a dance concert, in elementary school band, or maybe a play or musical? If you have, you know that anxious buzzing feeling you get through your nerves just before the curtains open and the lights rise. You feel like you’re going to throw up but you can’t stop smiling. It’s terrifying to share your art (music, acting, dance) with an audience, and you’re worried it won’t be perceived well… But still, you can’t wait to do it. That’s what it feels like to be publishing a book. It’s indescribable. Literally unbelievable — like, I have two proof copies of Ignite sitting in my house, and I can hold them in my hands and flip through the pages but it still doesn’t feel real. I’m still not convinced other people are going to be able to read it. BUT THEY ARE! Heck, you might read my book! You could love it, you could hate it, but either way, you’ve read my book and know the story I want to share. And hopefully you’ll come back for the sequels. See you on the other side, when I can officially say I’m a published author. WHAT?! Posted on June 3, 2013 by Kellie Sheridan Posted in Uncategorized	. Hello, hello!So… who doesn’t like free books? 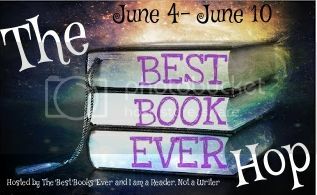 Well, today Patchwork Press is taking part in the Best Book Ever Hop hosted by I’m A Reader, Not A Writer & The Best Books Ever. Patchwork Press is a new publisher of young adult, new adult and middle grade titles and we have a lot of great books on their way over the coming year. We hope you’ll take a few minutes to poke around our website and get to know us a little better.As for our Best Books Ever category… these fall all across the board, but all in all, we’re indies at heart!Now, onto the prizes! One winner will get all three of the following ebooks in the format of his/her choice. Happy reading! Ignite by Erica Crouch: Penemuel (Pen) fell from grace over a millennium ago, yet there are still times she questions her decision to follow her twin brother, Azael, to Hell. Now that the archangel Michael has returned, threatening Lucifer’s vie for the throne, she begins questioning everything she has always believed.As Hell prepares for war – spreading a demonic virus and pilfering innocent souls to build an army – the lines separating the worlds blur. Fates erase and the future is left unwritten. Azael is determined that he and his sister will continue to serve as demons together, but for the first time in her life, Pen is not ruled by destiny. She has the freedom of choice. Follow the White Rabbit by Kellie Sheridan: For centuries, Wonderland thrived as the domain of beautiful bedlam and unapologetic madness. It was a place like no other. All it took was one girl slipping in through the cracks of the universe to start chaos spiraling toward order. In the 150 years since Alice’s visit, the realm has become tainted—almost normal. Rabbits in waistcoats and playing card minions are little more than creatures of myth, and Wonderland is literally falling to pieces.For Gwen, Rose, and Lucky, Wonderland is home, and yet they know little of its former glory. When the Alice prophecy resurfaces, they’ll have one chance to use Wonderland’s own legends to bring a little mayhem back into their reality. For she who controls Alice controls the fate of Wonderland. Mortality by Kellie Sheridan: After surviving a deadly plague outbreak, sixteen-year-old Savannah thought she had lived through the very worst of human history. There was no way to know that the miracle vaccine would put everyone at risk for a fate worse than un-death.Now, two very different kinds of infected walk the Earth, intent on nothing but feeding and destroying what little remains of civilization. When the inoculated are bitten, infection means watching on in silent horror as self-control disappears and the idea of feasting on loved ones becomes increasingly hard to ignore. Starving and forced to live inside of the abandoned high school, all Savannah wants is the chance to fight back. When a strange boy arrives with a plan to set everything right, she gets her chance. Meeting Cole changes everything. Mere survival will never be enough.